An updated release schedule is here. As always, if you have any questions about anything, please contact us directly at team@aeondreamstudios.com so we can help! 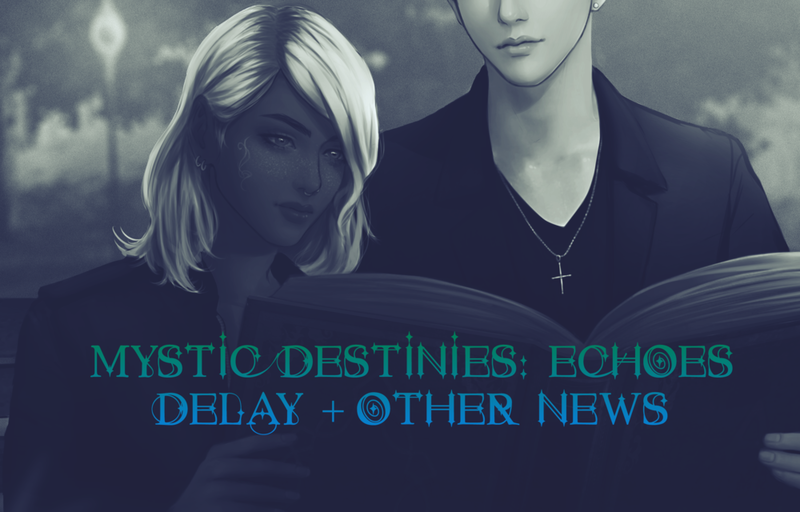 We will be pushing back the release for Mystic Destinies: Echoes to by mid-October. We feel incredibly sorry to have to disappoint those who have been patiently looking forward to it all this time. We regret to inform everyone that our CG artist we are currently working with for Echoes has had a death in her immediate family at this time, and had to move and resettle her work area. We have asked her not to pressure herself to finish the last remaining tasks during this difficult time for her. As mentioned in July, we will be out of the office during the final week of September. Although the reason for the delay is unfortunate, we are very excited to take the opportunity to polish the game while all physically together - we have not been able to do this since our company began. We have scheduled more interviews to be release during this time. We ask that the fans also continue to be understanding and patient while we complete our work. We want to present to you a complete and polished game without any missing content, and we are so very close to that goal. Hang in there! In the next update, we will be introducing a new store component to the Free version. Please understand the Free version will continue to be completely free, however the store will allow Free players to purchase individual chapters without committing to the full Premium purchase. We will be delaying Chapter 04 as it was not completed before the hiatus. It will be moved to October, along with any new art reveals. However, we will be releasing an extra story while we get Chapter 04 ready to give fans something to new to play. Eight will also be making his appearance in-game at the time of that early October update. Additionally, the store will feature our first extra premium content for TTEOTS. We will be releasing a POV playable story called Through Their Eyes: Four. It is a new concept we created to get even deeper into the heads of other characters. These POV stories will cover pivotal story moments from the perspective of other characters. Through Their Eyes will be an entire extra story section in which we plan to add more POV stories for everyone in the future, whenever we feel that we can add content that fans might find particularly enjoyable. You will be ultimately able to select the character, and then the specific POV story that you want to play. The stories will include the Premium content and act as if you had selected their route if applicable. When relating to the main story, this will be free for Premium players and cost between $0.99-$1.99 for Free players that choose to purchase it. As mentioned in July, ADS will be taking taking a one week hiatus at the end of September. During this time, the core writing team will be all meeting up with each other for a trip! This will be our first ever vacation and first time we are all meeting each other. Afterward, we will continue to work together physically for quite some time. Please understand at this time we may not respond to emails and messages until October. We hope to come back to you refreshed and ready to continue to provide great content!